The Western Digital My Passport Slim is the latest external hard drive in a long line of impressive drives from Western Digital. External drives such as the Western Digital My Passport Studio and Western Digital My Passport Essential have impressed us in the past with solid build quality, good portability and fast data transfer rates. The Western Digital My Passport Slim is in good company then, but how does it compare? The first thing to note about the Western Digital My Passport Slim is that it's remarkably small and light – much smaller than the Western Digital My Passport Essential or the Freecom Mobile Drive Sq TV, and about the same size as the compact Toshiba Stor.E Canvio. It's actually not much larger than an internal 2.5-inch laptop hard drive, with just a slim shell offering protection against knocks and drops. A frequent criticism of small external hard drives, which we pointed out in our Stor.E Canvio review, is that manufacturers often sacrifice protection in the pursuit of making the smallest body possible. Thankfully the Western Digital My Passport Slim doesn't suffer from this, with a metal enclosure and cobalt casing around the sides that keeps the drive safe. Even with this added protection, the Western Digital My Passport Slim remains light and easy to carry, and the metal case even looks pretty stylish. As with other Western Digital external hard drives, a number of apps are included on the hard drive to help you quickly back up your files, along with tools for configuring the drive and checking on its health. There is also an app called WD Security which allows you to password-protect the entire drive. This app is clear and easy to use, taking you step-by-step through the process of securing your data, whilst warning you about the consequences of losing the password once it is applied to the hard drive. The Western Digital My Passport Slim is USB 3.0, which means we expected high speeds when transferring data to and from the disk. The 120.9MB/s read and 120.8 MB/s write speeds don't disappoint, and are much higher than the 80.57MB/s and 80.5MB/s respective speeds of the older My Passport Essential. In a real world test a 1GB file transfers in just 10 seconds. 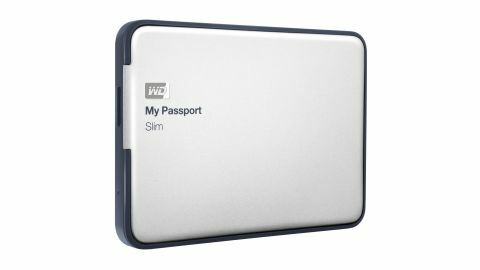 Overall the Western Digital My Passport Slim is a very impressive portable hard drive. It manages to combine a light and easy-to-carry design with a robust shell that protects it from damage when you're out and about. The selection of software included with the drive is simple to use, yet still useful, and the transfer rates over USB 3.0 are very good. It is one of the more expensive external hard drives out there, but with large 1TB and 2TB capacities, along with the excellent transfer speeds, we believe the price is more or less justified.